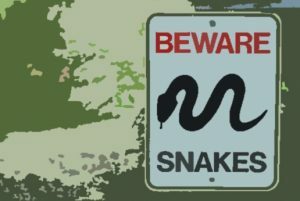 Best Snake Repellent Reviews: Top 7 in April 2019! If you live in an area where snakes are plentiful, chances are you’ve debated ways of eliminating them. Aside from their tendency to leave droppings and prey carcasses around – which makes an unsightly addition to your property – they can be dangerous. Venomous snakes can obviously be fatal, while even a non-poisonous snake can carry diseases and parasites, including salmonella, tapeworms and roundworms. Occasionally they make their way into homes or offices, which can be frightening for residents, although snakes typically do not attack unless provoked. Either way, they’re a nuisance for both pets and humans. 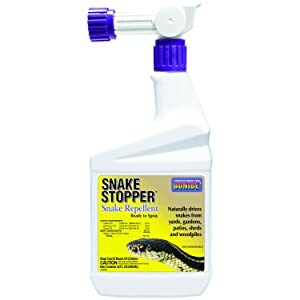 One of the most effective ways of repelling snakes can be choosing one of the best snake repellents in the market. From the many snake extermination methods available, you can also choose to contact a professional pest control company but it usually comes with a hefty price tag. Many of them are chemical-free, which is great if you have children or pets around. So how do you get rid of snakes in the most effective and prompt manner? To explore this further, I’ve rounded up some of my favorite products based on the product composition, its working effectiveness, and ease of use. Composition: Contains sulphur, fuller’s earth and water as the inactive ingredients, and these biodegradable granules are comprised of cedar oil, 3.1% and cinnamon oil, 0.6% along with clove oil, 0.3%. 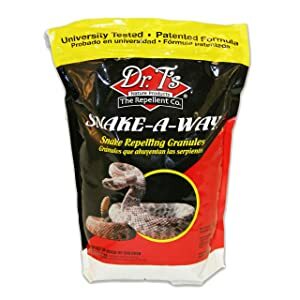 How it Works: This easy to apply snake repellent comes in granules form and naturally repels snakes by emitting sulphur and naphthalene, which temporarily effects a certain part of the snake’s brain, disorienting them. Usage: To use it, just shake the granules around the area that normally gets infested. Gloves are recommended while using this product at all times to ensure safety. The core ingredient used here is Naphthalene, a chemical and for full effectiveness needs reapplications every few weeks, particularly after it rains. Composition: This naphthalene-free granular snake repellent has diatomaceous earth, wintergreen oil mixture worth 96.2% along with cornmint oil 2.9% and cedarwood oil, 0.9% as the active ingredients in the product. How it works: It starts to work immediately and is effective in curbing snake activity for many weeks until its effect begins to work away. Make sure you are applying it evenly and thoroughly around the perimeter of the affected area. Leaving gaps or spaces may result in less effectiveness. 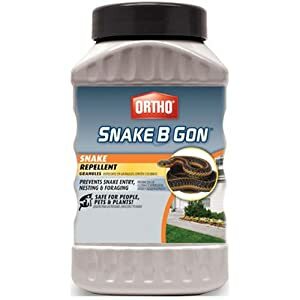 Usage: Meant for outdoor use, this product can be used in yards, landscapes and gardens to ward of snakes from the property. Reapplication is advisable to restore its effectiveness in case of heavy infestation off snakes or in places where heavy rain has occurred. Composition: This no-stink formula is comprised of cinnamonoil.geraniol castor oil, peppermint oil, and clove oil as its main ingredients. How it works: This is another product that works by affecting a snake’s senses, which makes it go away from your property in search of areas where it can find its prey. Using essential oils, this highly effective product has water-resistant properties, which is extremely convenient. Just sprinkle liberally around plants, property lines or buildings. Usage: This product gels well with many people who prefer the “no-stink” formula and the use of natural oils which makes it safe for use around children and pets. Composition: A sonic snake repellent comprised of solar panels and batteries works to keep the snakes away without the use of any toxic chemicals in it. 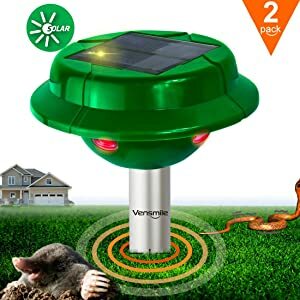 How it Works: This product works by emitting very faint vibrations, signalling danger to snakes and other pests who then move away from the property to never return. Usage: Just place the device in the area infested with snakes and this will comfortably cover an area of approximately 7500square feet. Using two devices is advisable as its more effective as a deterrent in repelling the snakes away. It’s safe to use near children and pets as it doesn’t contain chemicals. Composition: With cedar oil as its primary active ingredient, this snake repellent is biodegradable and works by repelling the snake and not by killing it. 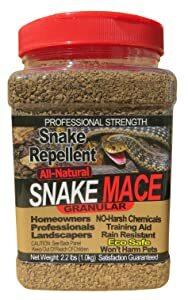 How it works: This naphthalene free formula works by confusing the snake’s sense of smell and makes it go to other areas far from the property of infestation. 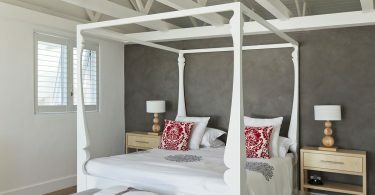 It can be used throughout the year as it’s a rain and water-resistant formulation. It is advisable to wear gloves when using this product for safety reasons. Usage: This is extremely easy to use and comes in a convenient shaker-style container, like a large salt dispenser. Just shake thoroughly around the perimeter and you’re good to go. Being a natural and eco-friendly product, this is safe to use around little children and pets. Composition: This snake stopper product contains 69.5% composition from a mixture of sodium sulfate and water with the main active ingredients being cinnamon oil 28% and cedarwood oil 2.0%. 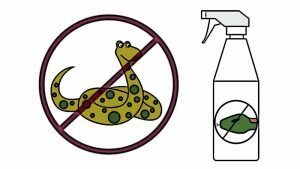 How it works: Bonide spray is highly effective, as the spray causes the snakes to avoid the infested area which has been sprayed and go to other areas. It doesn’t seek to harm them and just drives them away from the infested area. Usage: Convenient and easy to use, spray formulation works well for larger areas like swimming pools, garages, barns, homes, garden sheds and areas near woodpiles. Being biodegradable and made with natural ingredients, it is safe to use around children and pets. Composition: This snake deterrent is a natural snake repellent made from natural ingredients of peppermint oil, clove oil and cinnamon oil and does not have any toxic chemicals. 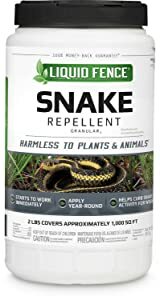 How it works: Equally effective for both venomous and non-venomous snakes, this natural snake repellent, works by disorienting a snake’s senses, making them more likely to stay away. Usage: The spray function makes it easier to spray large areas and many people prefer this toxin-free option. It’s easy to use and some oil-based products are slightly more resistant to rain erosion than granules. Q: Do all snakes attack? A: It’s uncommon for snakes to attack unprovoked. However, they will defend themselves if they believe they are at risk. If you or your pet accidentally steps on or interferes with one, they might react. In general, if you leave them alone, they will return in kind. Q: Can snakes infest buildings? A: Yes. While they don’t climb up facades the way rats do, snakes can get into buildings through spots at ground level or underneath your porch. If left untreated, they can be hard to get rid of because they’re hard to spot. They’re most commonly found in basements. Q: How to get rid of black snakes with a DIY product? A: There are many effective products that help deter snakes of all kinds, even the black ones. Choosing the best option depends on your lifestyle and how much time you’re willing to invest. Many people love the sonic repellents, as you just install them in the ground and let them do their thing. Unlike topical repellents, you don’t have to reapply once they fade. Some people are uncomfortable using chemicals like sulphur and naphthalene, although some people find they are stronger and more effective that toxin-free alternatives. Q: Do you need a pest control technician to get rid of snakes? A: Not necessarily. Some people might choose this option if they have a severe infestation or if it is threatening their livelihood, like their restaurant business or family-friendly campsite. Technicians usually trap and relocate any snakes, which may solve an immediate problem, but not repel any future infestations. It’s expensive to hire pest control professionals, so many people try the over-the-counter method and find it perfectly effective. Q: Where do snakes normally live? A: For the most part, snakes like cool, dark locations where it’s easy to find food. This is why they are often attracted to basements. They tend to prefer underground locations, like burrows and tunnels, and are commonly found nesting in woodpiles, crawl spaces, or other dark, compact spaces. Some snakes enjoy shrubs and leafy plants as well, where they can blend in. Q: Can snakes make you sick? A: Yes. Not every snake is venomous, but venomous snake bites are definitely a concern in some areas. Approximately 8,000 snake bites in the USA every year are from venomous snakes, which can be fatal if not treated. Even non-venomous snakes can transmit diseases and parasites, including salmonella and tapeworms. This can be caused by contaminated snake feces, which means snakes can transmit illnesses without even touching you. For this reason, it’s a good idea to eliminate them as soon as you notice them around. A: Apart from keeping your house and garden and all surrounding areas clean of weeds, and decaying vegetation, it is prudent to seal all cracks in and around the house too, to avoid giving snakes any entry points. Using moth balls is also a natural way to keep snakes at bay as it doesn’t harm them. Just the smell makes them stay away from the area scattered with moth balls. When you’re planning to invest in pest control, it’s good to know your options. For snakes, many of the over-the-counter repellents on the market work by affecting a sensory organ in the snake’s brain. This organ helps the snake navigate and find its prey. When it’s compromised, the snake becomes disoriented and slithers away in search of a better location. Most snake products use either chemicals, essential oils or ultrasonic waves to disrupt these senses. 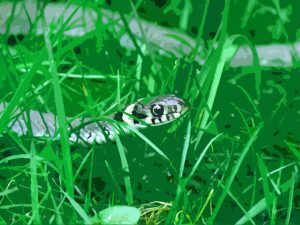 Unlike some pest, like rats, the treatment for snakes don’t usually focus on killing them, but merely refocusing their attention elsewhere. 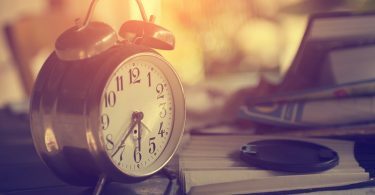 The products I’ve chosen for this list includes a range of these mechanisms and are top picks for both affordability and effectiveness. When it comes to creepy crawly pests, you certainly don’t have time to waste on expensive or unreliable methods. Each Of These Infrared Gas Grills Are A Good Choice! Were you Looking for THE Grill Cover for Weber Genesis? Gas Charcoal Combo Grills – Buyer’s Guide! Which Propane Grills Under 300 Are The Best? Best Recliners for Sleeping – Start a New Life Today!